Heather Lane | Graduate Philadelphia! Due to the birth of my beautiful daughter, I had to discontinue my enrollment after completing two years. 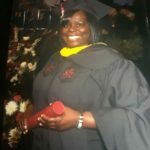 Finishing my degree was always in the back of my mind so, in 2000, when I qualified to be able to take classes for free after a year of employment at Thomas Jefferson University, I jumped on the opportunity. I started off just taking courses that I really was interested in just to see if I could handle all that was associated with going to school, working full time and raising a child. I received an A in that first course then a B in the next course the following semester. I eventually decided to go for an Associate’s degree in general science from Thomas Jefferson University (TJU). During the time I was taking classes at TJU, I found out about an animal center management program at Harcum Junior College. This program was more geared to my goal of becoming a supervisor of a laboratory animal facility so I transferred to Harcum in 2012. I went to Graduate! Philadelphia to meet with an advisor before deciding to transfer to Harcum and they explained how the financial aid process worked and how much I could get for school. They helped me submit my first FASFA application. The plan was to just get my associates degree and be done with school but I realized that I really enjoyed being in school. After graduating from Harcum in 2014 with a 3.89 GPA, I decided to continue my education and pursue my Bachelor’s degree in Managing Human Capital from Saint Joseph University which I received on May 19, 2018. I am planning on starting a Master’s degree program in 2019.